Following my feature on Headless Guru Records, I decided to post this review featuring another one of their early releases, Brighton's own pop-punks River Jumpers. Their debut album Chapters was a split vinyl release between HGR and Waterslide Records from Japan. Forming in 2011, River Jumpers have been touring relentlessly across the UK and with their influences taken from the likes of Strike Anywhere and Alkaline Trio and with shows alongside The Flatliners coming up in August, they are sure to give the UK scene a much needed postive shot in the arm. When you glance back though the records that Headless Guru has released, you might be surprised to River Jumpers amongst them, especially when they're alongside bands of a much heavier persuasion. That's part of the charm though and highlights the forward thinking and personality that many of the UK's new labels have. River Jumpers share that personality, electing to perform their pop-punk with their own sound. They prefer to keep the Americanisms to a minimum, especially in the vocal department. Starting with the title track, they set their stall out early. A melodic, guitar driven sound that will get your toes tapping and your head banging in equal measure. People may come with inevitable comparisons to fellow UK pop-punks Me Vs Hero, but then that's not a bad thing. Even in the opening songs, it's easy to believe that River Jumpers could become leaders of a big resurgence in UK pop-punk. With catchy melodies and simple musicianship, songs like Substance and Integrity are bound to get stuck in you head. Another thing you'll notice about Chapters, is that River Jumpers don't play at warp speed. Their structures and tempos are measured and just slightly faster that mid-paced, which means they're not overplaying. This helps the music sound cleaner and more listenable in my eyes. You can even hear the link between the 70s/80s punk sound and it's modern variant, which is testament to River Jumpers song writing. Their songs are pitched around the same length throughout, that three-four minute mark that separates punk from it's more progressive sub-genre cousins. That's not to say it's predictable though. Fans of punk will appreciate the familiarity and see Chapters as a safe-haven, something to listen to when they need energy and genuine musical inspiration. Failing that though, its just damn good pop punk. A Change To Modern Culture, Diamonds and Five Doors Down follow the same formula and inject it with satisfying vocal melodies. As you pass the halfway point, Short Stories carries a thickness to it, thanks to some cool intro guitar. It's got more of an experimental tempo to it during the verses, but it'll still get buried in your head. The standout track me though is Coffeeshop Revolutionaries. So soothing to these ears, with some soaring harmonies and that feeling of satisfaction you get when I find a song that you could just listen to on repeat all day. If you weren't in a good mood when you put Chapters on, you will be as you reach its end. You feel like you could sing-along to every song even on first listen and when the tempo increases during Look Away, you can't help but move with it. A Slower Speed highlights the band's political edge with the lyrics. Closing track Strength of Ten finishes things in grand fashion, collecting the best bits of Chapters and shoehorning it into one four and a half minute feel good hit. This is the type of you have playing when your with friends, chatting time away in the sun on a summer's evening. I know that sound slushy, but that's how it comes across to me. It's always a pleasant surprise when a band like River Jumpers appears, sometimes out of nowhere and produces which is mature beyond their years. 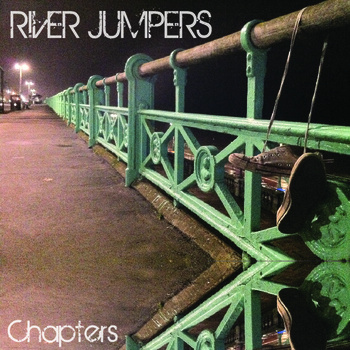 Chapters is that album and River Jumpers are brilliant. I here they’re due to release their debut EP Words, Chords and Irony on vinyl shortly, so get your hands on that but for now, Chapters will easily be on repeat. You can buy the Chapters LP on sumptuous white vinyl from Headless Guru Records here http://headlessgururecords.bigcartel.com/.